It’s no secret that buying a home is expensive. Financing a home is probably one of the biggest expenses you’ll ever have in your lifetime. For people who have purchased homes before, the homebuying process is not nearly as shocking or difficult as that first round of homeownership. Veteran homeowners know what to expect, what to avoid, and can figure out a more accurate budget for expenses. As someone who’s in the market to buy a home for the first time, I’ve noticed quite a few unexpected expenses that aren’t widely talked about. 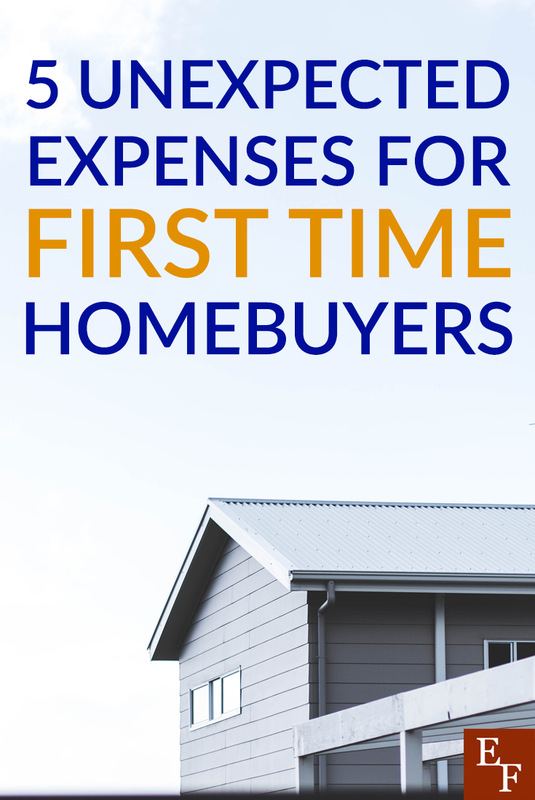 Here are 5 unexpected expenses for first-time homebuyers that you’ll need to watch out for. Closing costs are no secret. But, the list of expenses you have to cover when you close on your home can really shock you if you haven’t prepared. You probably already know you have to pay for a home inspection and appraisal, but you’ll also be required to pay for big-ticket items like a loan fee, attorney’s fee, title fee, escrow contribution for taxes, and 12 months of homeowner’s insurance upfront. All of those expenses can really add up. Needless to say, I totally underestimated our closing costs. We didn’t save as much as I would have hoped to comfortably cover them. This put us in a pretty rough spot but thankfully, we’re able to receive some closing costs money from the sellers. The tricky thing is that you won’t know for sure how much your closing costs will be until you find a house and get an offer approved. Then the loan process will start and you’ll learn more about your expenses. This is why it’s best to always plan to save more than you need and negotiate a closing cost credit with the seller to ease your burden. Property tax is a tax assessed on real estate. The tax is usually based on the value of the property (including the land) you own. Value is usually assessed by local or municipal governments. Property taxes vary from state to state and can also increase or decrease based on your city or even your neighborhood. That being said, don’t fall for the mistake of thinking your property taxes won’t ever change. I’ve heard horror stories of people who purchased a home with a mortgage payment they could afford. But then have the property taxes increase and raise their mortgage payment the following year. It’s important to research property tax rates and trends over recent years when you’re considering a particular house. This will help keep your total housing costs around 20% – 25% when you buy a home. The generally rule of thumb is to avoid letting your housing expenses exceed 30%, but since property taxes tend to fluctuate, you want to give yourself some proper wiggle room. Home maintenance and repairs are often underestimated or unexpected altogether. Realize that you may need to do repairs on the home you buy especially after you have the inspection done. The bank or home sellers may take care of some repairs. But, you may negotiate and end up taking care of some things on your own especially if you purchase the home as is. Then, there are cosmetic costs to consider. For example, I walked through plenty of houses that needed a lot of TLC or some tweaks to really bring out the space. I’ve thought about repainting, replacing flooring, replacing a bathroom vanity, and adding shutters to exterior windows for example. All of those expenses can add up, and it’s not really something I can justify asking the seller to do. As long as the big ticket items are taken care of and the house is safe and up to code, the buyer is responsible for all the little tweaks to fix the home up to their liking. When it comes to repairs, it’s wise to budget 1% – 3% of the home’s value on repairs annually. If some of the appliances or items in the home are older, you can request a 12-month warranty to help you cover some repairs and updates. This is something I’m not looking forward to. My husband and I will be moving from a 2-bedroom apartment to a home sometime in the near future. While we do pay some utilities now, I know that we will have a much bigger burden as homeowners. Right now, we only pay electric and water but in a home we’d pay electric, gas, water, and garbage. Not to mention, water costs may go up when considering lawn care and doing laundry in the home. I’ve never had a gas bill before since all of my previous apartments all had electric ovens. Making a transition like this could be a rude awakening for new homeowners who have no idea how much these bills will cost. To get a good feel for what your utilities could cost you, ask a friend in the area and do your research to come up with a solid estimate. Then, make sure you have some savings lined up to cover the surplus. After weeks of hard work, negotiating, and paying fees, you now have to pack up all your stuff and move into the new house. If your wallet wasn’t cleaned out after closing costs, moving costs could just be the icing on the cake. You’ll have to pay cleaning supplies, the Houston based power washing company to do a deep cleaning procedure, moving supplies, movers, transportation for your belongings, and even food once you settle in. To prepare for these expenses, call moving companies ahead of time to get quotes. You can also ask friends and family to pitch in on moving day. Set a budget based on your plans. When it comes to buying your first home, you can never really save too much money. There will always be some unexpected expense along with costs that exceed the budget you planned out. This is why it’s best to put a large down payment down but also have a fully funded emergency fund. This way you aren’t stressed about finances. Have you ever dealt with these unexpected expenses as a homeowner? What other unexpected expenses have you seen? WHEN ARE TENANTS MOST LIKELY TO SEARCH FOR A NEW HOME?